By dawn however, the winds had diminished considerably although heavy swells and cloudy skies suggested that this was merely the calm before the storm–as indeed it was. With ominous clouds building quickly to the SE, the mizzen sail was lowered as is the standard procedure. 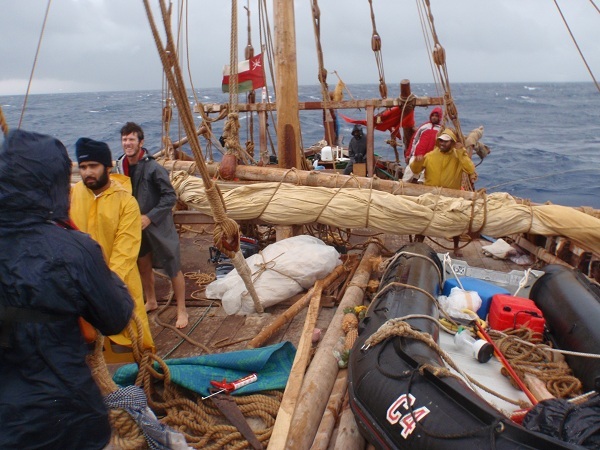 Then all hands were called on deck to lower the main sail just as the squall hit at about 1400 with driving rain and spray, and winds of 43 knots. After considerable effort and determination, the crew managed to lower the sail. Once both sails were secured, there was little to do but try to stay as dry and warm as possible, and wait for the storm to pass. Thankfully, the rain and wind only continued for several hours, although the swells lasted long into the night. Currently the winds are very light. As a precaution, we are proceeding with only one sail raised until daylight enables us to conduct a thorough inspection of the ship and get the area below decks dried out and organized. In the meantime, those who are off duty are enjoying a well-deserved sleep.